Awarded Australias’ Gin Bar Of The Year for the last 3 years running, our first-class Cocktail Bar specialises in the famed Juniper spirit, housing over 700 Gins ‘new and old’, Genever, specially crafted cocktails, boutique-bottled beers and artisnal spirits, plus a great selection of Australian and European wines. 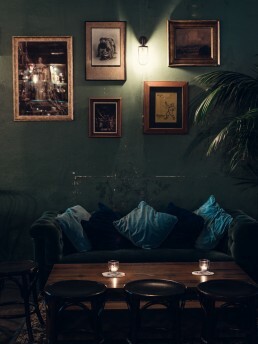 As you step into our parlour style barbershop, You’ll soon be immersed in the nostalgic atmosphere of a bygone era, with the subtle sounds of cocktail shakers exuding from our adjoining award winning Cocktail Bar. Throughout the day and into the evening, The Barber Shop offers a range of professional grooming services for the discerning modern gent. Our Master Barbers utilise vintage tools for the continuously-evolving contemporary precision cuts as well as traditional barber services, including hot towel shaves, beard trimming and styling. 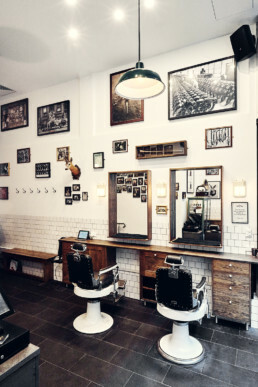 Featuring 6 Barber Shop chairs, a small corner cocktail bar with a central waiting area for clients to relax before services, The Barber Shop Barangaroo maintains the successful marque of our current barber shop on York Street. At Barangaroo, our clients can expect the highest quality Barbering and grooming services from well trained, professional barbers. All services are tailored to the specific needs of each of our clients. We offer practical advice on the most suitable product or treatments to get you looking your very best! For all your gift needs, we have a wide selection of premium male grooming brands, such as cologne, beard oils and other lifestyle apparel such as books and quality leather goods.